Watching a live theatre performance can stimulate your cardiovascular system to the same extent as doing 28 minutes of healthy cardio exercise, a new study has found. The research, conducted by scientists from UCL Division of Psychology and Language Sciences (PaLS) and the University of Lancaster, in association with Encore Tickets, monitored the heart rates, brain activity, and other physiological signals of 12 individuals at a live performance of the West End musical Dreamgirls. During the performance, the heartrates of audience members spent an average of 28 minutes beating at an elevated range between 50% - 70% of their maximum heart rate. The British Heart Foundation identify this level of heartrate as the optimal heart rate to stimulate cardio fitness and stamina. So, although they were seated for the performance, audience members spent an average of 28 minutes engaged in healthy cardio exercise. Dr Joseph Devlin, Head of Experimental Psychology (EP) at PaLS, said: "This demonstration paints quite a clear picture that attending a live performance has an impact on cardiovascular activity." "By the end of the first act, heart rates nearly doubled from their resting state at the beginning, while in the second act, it tripled. You see comparable changes in heart rate in professional tennis players during burst of highly intense exertion such as long and fast rallies." Dr Devlin collaborated with John Hogan and Dr Daniel C. Richardson (both of EP) and Dr Helen Nuttall (Lancaster University, also Honorary Lecturer at UCL) on the study for Encore Tickets. Encore Tickets has emphasised the physical benefits of attending a live theatre performance. For example, they have found that for a third of attendees, the most enjoyable aspect of live theatre is the feeling the live experience gives them, such as emotions and goosebumps. 15 per cent have noticed a change in their breathing, whether that's slower or faster, whilst almost one third have experienced gasping or jumping in shock. For this study, the research team used wearable technology to track various physiological signals linked to the autonomic nervous system, which in turn relates to emotion and arousal. The signals were then averaged across audience members give an indication of the time-course of a shared experience. They also conducted a literature review of other research that supported their findings on the impact of live theatre. One study they reference tracked the heart rate of students during a lecture, using it as a measure of their interest and engagement. However, the research team identified another study that suggested that a higher average heart rate does not necessarily indicate a higher overall emotional or cognitive engagement in a performance or a lecture. This is because sometimes at moments of deeper engagement and concentration, arousal and heart rate can decrease. However a greater range of responses may indicate a richer experience, from a low heart rate of concentrated engagement to a peak of arousal. 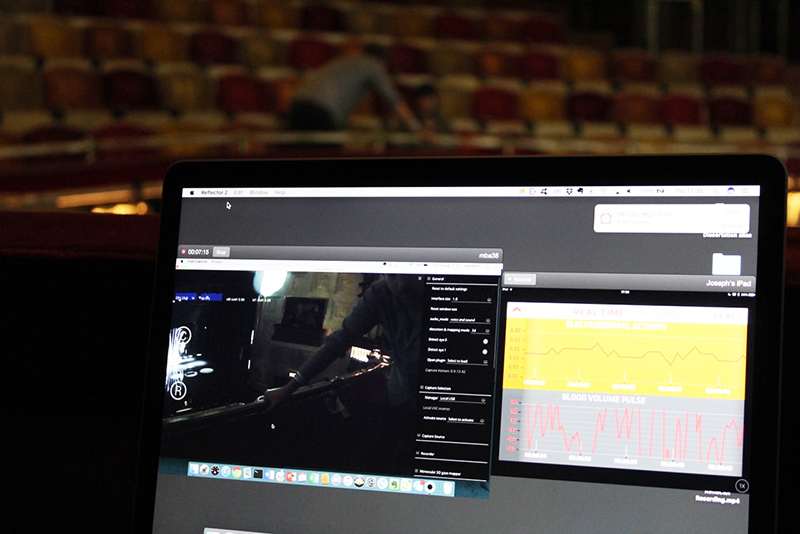 Dr Devlin said: "Within the results of the heart rate data from the theatre audience, there was a large dynamic range consistent with the fact that being in a live audience increases the emotional intensity of the experience. The results indicate that the highs and lows of the theatre performance allow for a range of emotions that can stimulate the heart and induce heartrate activity that is parallel to an exerting cardio work out." The study was commissioned by Encore Tickets, and will not be published in an academic journal. Fernandez, J., Mendez‐Villanueva, A. & Pluim, BM. (2006) Intensity of tennis match play. British Journal of Sports Medicine, 40(5): 387-391. Jola, C., Grosbras, M.-H., Pollick, F. E. (2011). Arousal decrease in 'Sleeping Beauty': audiences' neurophysiological correlates to watching a narrative dance performance of 2.5 hrs. Dance Research Electronic. 29.2, 378-403.